The trailhead is a good friend to all hikers, but it may be especially helpful to the day-hiker. There it is, the turnoff as indicated by the map, the sign indicating hiking and adventure are proximal, the quick check to ascertain the fullness of the parking lot–dismay if too full, glee if many spots still available, the helpful map indicating distances and local conditions (topographic, climactic, and sometimes warnings pertaining to fauna such as bears), and then finally, a glimpse of the opening steps onto the trail. That sight reminds you the trailhead is a portal to the wild; step through it and be transported–if you walk far enough. The trailhead is tame, but it lets you through to spaces and regions considerably less under the sway of man’s powers. (And let’s not forget the provision of a porta-pottie, which has the magical ability to make you lighter in body and mind before you start dragging backpack and body up and down slopes and scree.) In wilder, less developed hiking regions, the trailhead marks the end of the motorable road; ‘civilization’ goes no further; you are on your own now. In North America’s national and state parks, it marks the connection of the wilderness with civilization in a slightly different way. The road ends here too but it does not run out; it carries on elsewhere. Returning to the trailhead is a pleasure too; the hike is over, feet are sore, clothes are sweaty and prone to producing unpleasant chills when the wind picks up, the light may be fading, rest and relaxation and refueling beckon. The car may carry a change of clothes, some food, and even warmth as bad weather–the same winds and rain which sped up the last part of your hike–closes in. Many a hiker will pose for a weary but triumphant photo next to the trail map after completing the hike; a job–of sorts–well done. On occasion, of course, the sights and sounds of civilization audible and visible on the approach to the trailhead can serve as disconcerting reminders that you have left the pleasures–solitude, vistas–of the wilderness behind and that immersion in the weekday world awaits. Sometimes you can return to the trailhead–after completing your hike for the day–and find out you’ve been a badass without even knowing it. This photo was taken last Tuesday shortly after we–my wife, my toddler daughter, and myself–completed the Helen Lake hike in Banff National Park (Alberta, Canada). Along the way, we heard about grizzly encounters from other hikers on the trail–apparently, a pair had been sighted next to a creek crossing, and one had even charged a woman hiker as an aggressive warning. 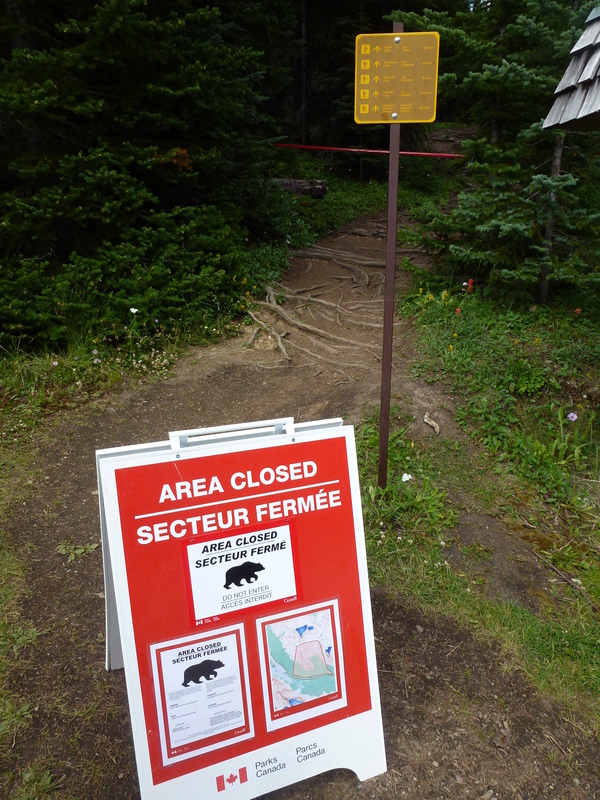 We debated carrying on–we weren’t carrying bear spray, as another hiker helpfully pointed out–and did, but behind us, the parks authority closed off the trail. On our return–we had skipped the Dolomite Pass section of the hike because it was getting late in the day–we commented on the relative absence of hikers and only found out the reason once we had returned. This entry was posted in Travel and tagged Alberta, Banff National Park, bears, Canada, Dolomite Pass, grizzlies, Helen Lake, hiking, trailhead.